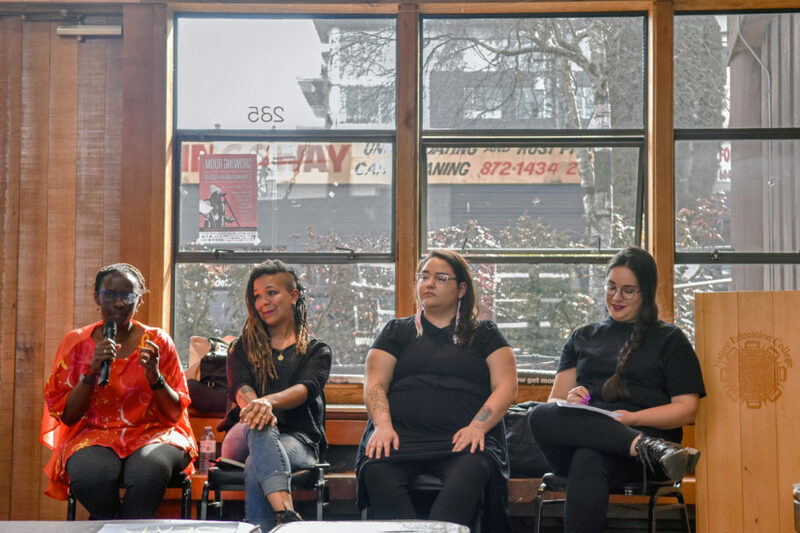 A panel on art and academia was held as part of Growing Room Festival, a feminist literary festival, at Native Education College on March 10. The event moderator, Emily Riddle, asked panelists Lindsay Nixon, Robyn Maynard, and Juliane Okot Bitek about their experiences as both academics and marginalized artists. Academia has been long occupied by white, male-dominated spaces. Riddle asked how the panelists chose to navigate that environment throughout their scholastic, personal, and professional lives. Nixon spoke about making sure that their work is representative of people whose voices aren’t often heard within courses and events related to Indigenous studies at universities. Making spaces for queer people, drug-using people, and trans people motivates them to be creative. Maynard discussed how truly progressive spaces are difficult to find in academia, and that activism and community work needs to be considered more in post-secondary curricula and programming. Maynard says that knowledge gained from academia tends to be sexist, racist, or violent in some way, and that knowledge gained outside of the university must be valued as real intellect. Bitek believes that, in order to think critically about post-secondary schools, she must acknowledge that they are privileged spaces. As a Black woman, she struggles to find voices like hers in academia, and keeps this in mind during her own creative process so that others with similar identities and experiences to hers may see themselves reflected in her work. The panelists were asked to describe the people they were when they started their degrees in comparison to who they are today. Nixon, who went to the Simone de Beauvoir Institute in Montreal, described themself as “a fiery activist” with “bright eyes and a bushy tail” in their early days at post-secondary school. While Bitek says she’s unsure of how to describe who she was when she started university, she does feel that she was much more optimistic in the past. Despite the fact that she is “much more jaded now,” she still feels that she “has work to do” in the community.